Gstaad, in the Bern canton, western Switzerland, is a glamorous and sophisticated resort, destination for celebrities and jet-setters. On the main street, the Promenade, there are boutiques and showrooms of the greatest designers. Who gets to Gstaad for the first time can be a bit surprised. How can this western town of Switzerland be so small and seemingly quiet but well known and frequented by celebrities, stars and starlets from all over Europe? There is no answer, but undeniably that is: in winter as well as in summer, the town is visited by celebrities and stars: you go to Gstaad for you visibility, at least once a year. However, in addition to clubs, restaurants and hotels (including the famous Palace Hotel Gstaad, overlooking the town like a medieval castle and fulcrum of social life), Gstaad offers excellent and very well maintained ski areas. Thanks to the lifts it is possible to reach the slopes of Chateau d'Oex and those of Les Diablerets glacier: for snowboarding, there are the slopes above the cable car Eggli, while for cross-country you can enjoy more than 60 km of loops, for all levels and abilities. In summer, Gstaad does not lose its charm and offers, in addition to the possibility of hiking and trekking, various facilities and trails for mountain biking, rafting and canyoning in Saane River, as well as many opportunities for paragliding and hang gliding. Gstaad hosts various international sports events such as the ATP tennis tournament, the Allianz Suisse Open Gstaad, the world championships of beach volleyball, golf and polo tournaments (Polo Silver Cup Gstaad), but also cultural and musical events, such as the Yehudi Menuhin Festival, the classical music festival in August rather than the Gstaad Country Night, a three days continuous in September dedicated to country music. Gstaad is famous for the quality of food, predominantly local production, both for cheese (like the great Hobelkäse), and meat of cattles raised at high altitude: the typical dish is cooked hip accompanied by mustard produced in the area, rather than herbs and mushrooms also widely used in local cuisine. Gstaad is also easy to be reached, it is located indeed on the Panoramic Express railway line between Montreux and Spiez. The only problem in Gstaad are the prices, definitely above average and exactly suited to a wealthy tourist. 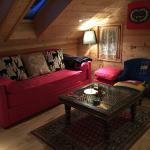 Hotel Le Grand Chalet awaits you on a hillside just over Gstaad. From the structure, with a fitness center with steam room and sauna, you will enjoy a stunning panorama. The Posthotel Rössli is a charming 3 star hotel situated in the heart of Gstaad. The traditional structure in alpine style, dates back to 1845 and is in perfect harmony with the surrounding buildings and landscape. The Hotel Olden is a refined 4-star hotel located in the centre of Gstaad. The area is particularly suitable for sport lovers as they can choose from golf, hiking, tennis, rafting, and skiing, of course. L'Arc En Ciel is a renowned 4-star resort in an alpine style, situated in a quiet and sunny location near Gstaad, near the ski lifts. This area is great for hiking and mountain biking. The Gstaaderhof Swiss Quality Hotel, elegant 4-star hotel in Gstaad - one of the most important tourist destinations in the Swiss Alps, welcomes you in a pleasant and intimate atmosphere. Gstaad Hotel Bellerive awaits you near the ski resort of Eggli-La Videmanette near the tourist resort of Gstaad. The hotel has a beauty salon and an elegant bar with a fireplace where you can spend relaxing moments.